The black DisplayPort to VGA Video Adapter Converter from StarTech offers a cost-effective DisplayPort to 15-pin VGA connection. 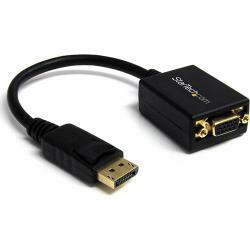 You can connect a VGA computer monitor to a DisplayPort video card/output, without the expense of upgrading the monitor for compatibility. It supports PC resolutions up to 1920 x 1200, and HDTV resolutions up to 1080p. This high-quality plug-and-play adapter offers clean, clear picture clarity. The integrated chip provides an active digital to analog conversion, thus eliminating the need for any installable software or drivers. You simply need to connect the adapter to your DisplayPort video source and plug your VGA cable into your monitor.